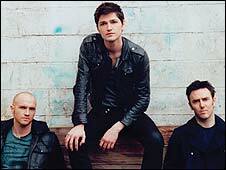 Irish band The Script have entered the album chart at number one with their self-titled debut. The three-piece displaced Abba's Gold compilation, which was the oldest album chart-topper last week. In the singles rundown, US singer Katy Perry remained top for a second week with her song I Kissed A Girl. While The Script scored a number one album, their single The Man Who Can't Be Moved climbed one place to three, behind Kid Rock's All Summer Long. The band also had another single in the top 40 after We Cry moved up 22 places to 33. Their debut song reached number 15 earlier this year. The highest debut in the singles chart was Madcon's Beggin' at seven, while Bloc Party's Mercury was the only other new entry inside the top 20 at 16. Despite a sharp climb last week from 34 to number nine, R&B star Rihanna's song Disturbia only rose a further three places to six. Coldplay's Viva La Vida, meanwhile, went back into the top 10, clambering four places from last week's 14. Elsewhere in the album chart, Noah and The Whale scored a top five success with Peaceful The World Lays Me Down. Crooner Jane McDonald, who shot to fame as one of the stars of BBC fly-on-the-wall documentary The Cruise, entered at number seven with a new collection.